Since the posting last Tuesday was about the wedding of our two main characters, James Neville and Catherine, I thought I would just continue with a bit more of the story of those next few months of their lives; at least as much as we have put together considering that they are no longer writing letters and leaving them laying around for snooping children to find years later. James Neville and Catherine LeDuke returned by Greyhound Bus following their Christmas Holiday Wedding in Memphis, Tennessee and their short visit to Tiptonville where James Neville presented his new bride to his family. When they arrived back at Burritt College in Spencer, Tennessee they took up their first residence in the two room, dormitory apartment which James Neville had lived in during the first four months of the school year. They lived there until the last week of May of 1937. As James Neville had arranged they took their meals at Mrs. Worthington’s Boarding House, trudging through the snow for most of the winter months. Catherine wore her new galoshes and heavy winter coat she brought with her from Memphis. She got very cold at least three times a day. 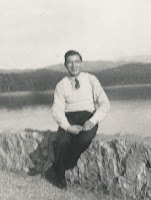 While James Neville was not particularly happy with his first teaching experience at Burritt College he felt he was basically doing a good job and had assumed that if no other job surfaced for the 1937-38 school year, he could always continue on at Burritt. 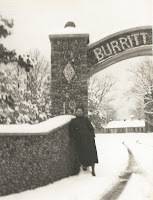 When he completed his obligation to Burritt College in May of 1937 he did not re-apply to teach the next year believing that he and Catherine could both find teaching jobs elsewhere. 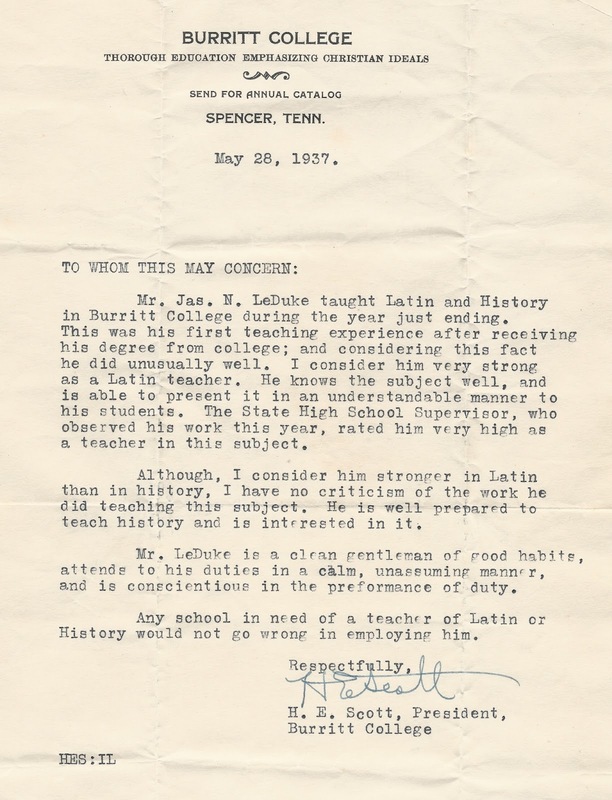 He received the following letter of recommendation from the Head Master, Mr. H. E. Scott. 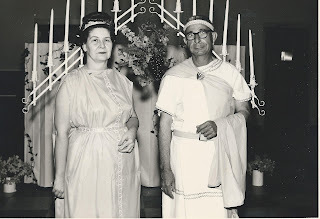 James Neville and Catherine spent the next several months bouncing back and forth between Catherine's family home in Memphis and James Neville's in Tiptonville. When it became obvious that no teaching jobs were on the immediate horizon, James Neville recontacted Mr. Scott. 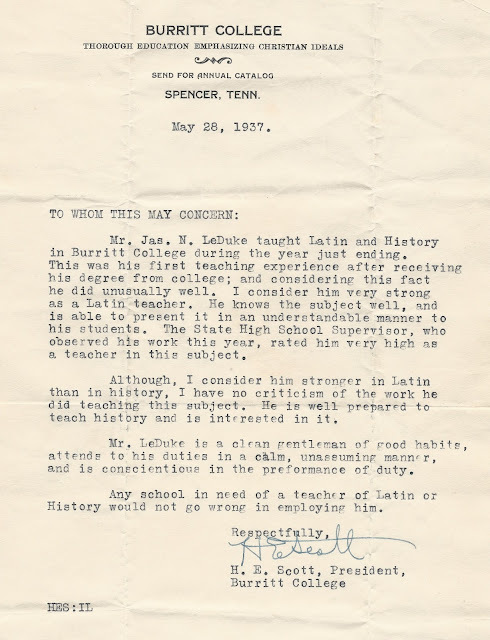 Unfortunately there was no position available for him at Burritt for reasons that were unrelated to his teaching abilities. He learned that most of the inadequacies, inefficiencies, and seemingly poor management at the school were not the fault of Mr. Scott. During the previous school year none of the faculty members at Burritt were aware that the school was in such serious financial circumstances. Much of the time Mr. Scott was off the campus that year was spent pleading for assistance from state, county, and even federal governments for financial aid. 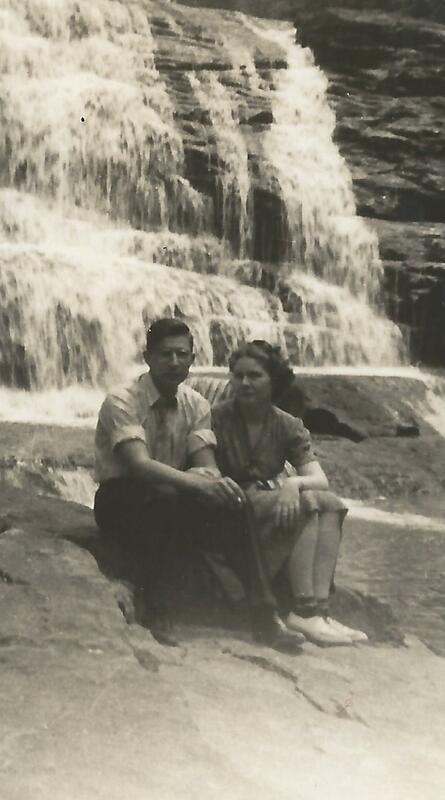 It would not be found mainly because Van Buren County had actually begun construction on a large consolidated High School in the summer of 1936, James Neville's first teaching year. The new school was completed and opened in 1938. 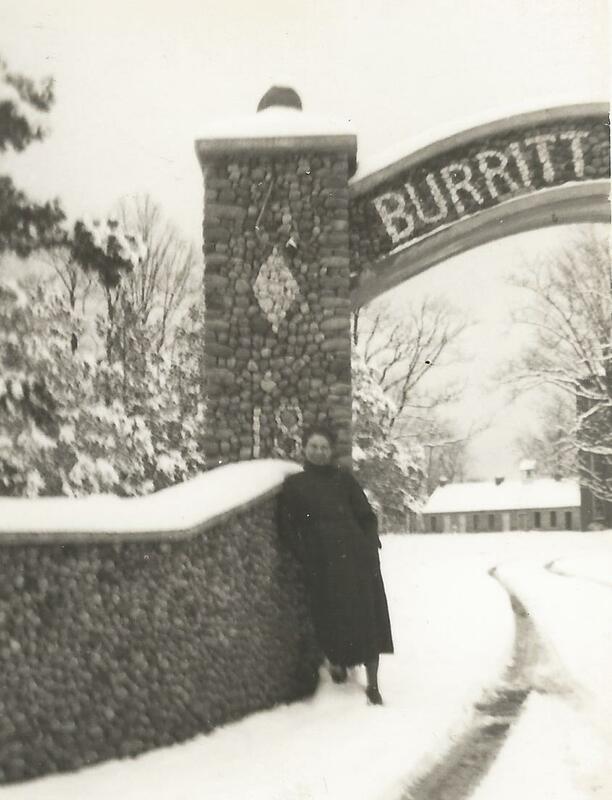 It's opening forced Burritt College to close its doors forever. The lack of school books, the condition of the physical plant, and even the low salaries at Burritt were not imagined problems frustrating James Neville that entire first school year. Despite the conditions surrounding his first teaching experience, James Neville gained much that fall, winter, and spring of 1936-1937. Not the least of which was a new bride. Van Buren County's loss ultimately became Lake County's gain. Ooops! The wrong valedictorian got the credit!